~ love what you have. have what you love. LAST WEEK I gave you a glimpse of the outside of our home as we transition into the cooler months. Halloween soon will take over our household so I wanted to give you a peek of the fall decor I incorporated inside before it’s too late! Essentially all of my indoor fall decorating happened in the living room since it’s the space where we spend the most time and the space guests see when they come to visit. Here’s what I did, along with a few tips for transitioning your living room into fall with minimal clean up when it comes time to break out the skulls, jack o’ lanterns and spider webs. Change up the mantel. 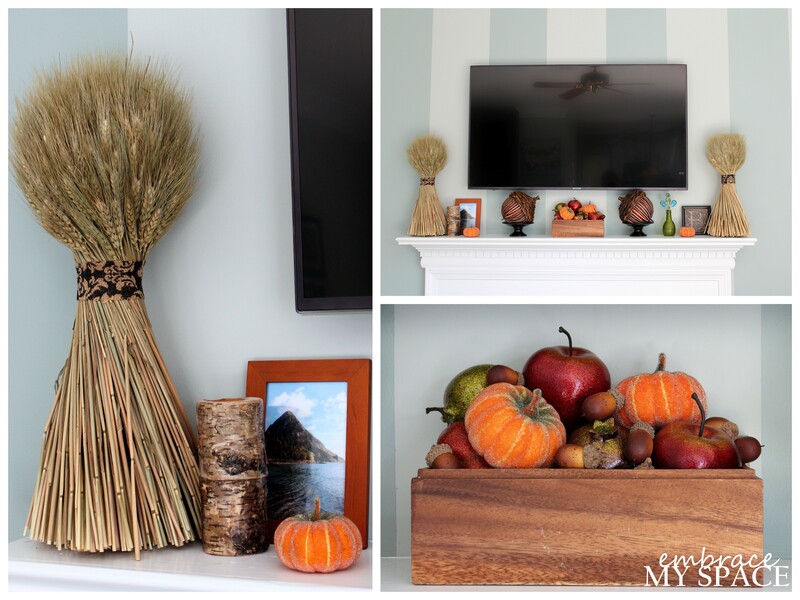 Typically I display a combination of shells, sea glass and other natural elements on our mantel, but for fall it’s all about wheat, acorns and pumpkins! Since our TV is above the mantel I try to keep the decorations to a minimum. My goal with styling the mantel was to create symmetry using either matching items (wheat, acorns on candle pedestals) or items that are similar in size/shape (“wood” candle and glass vase). Layer in some new textiles. Another way I bring fall into our living room is changing up the toss pillows. This is a really easy way to change the feel of your room. Now I’m not saying that you should go out and buy pillows adorned with pumpkins, acorns and fall leaves. Think about color and texture instead. Lucky for me, the toss pillows on my two occasional chairs are reversible. In the summer, my pillows are flipped to the flowered side. For fall I flip them to the other side, which is a rich green velvet. The color still works with my overall scheme in the living room, but the warmer texture announces that the weather outside is getting cooler! I also picked up two textured pillows from Target to add to the mix. The neutral color allows me to keep my other toss pillows in place, while still adding some seasonal warmth to the sofa. Swap in seasonal art. If you’ve stopped by Embrace My Space in the past, you might know that I’m obsessed with chalkboard paint. 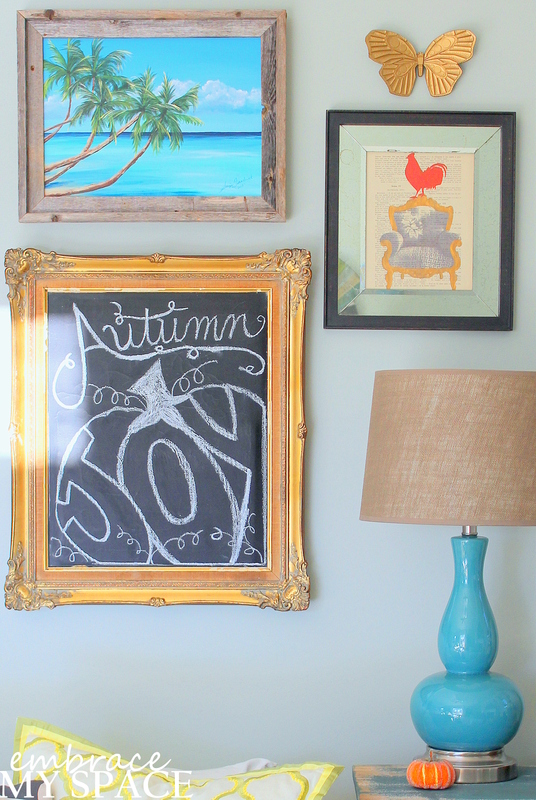 I have this chalkboard in a gilt frame as part of our living room gallery wall and I change out the drawing with each season. While you don’t need to use a chalkboard to change up your seasonal art, I find this to be a really simple method of doing so! 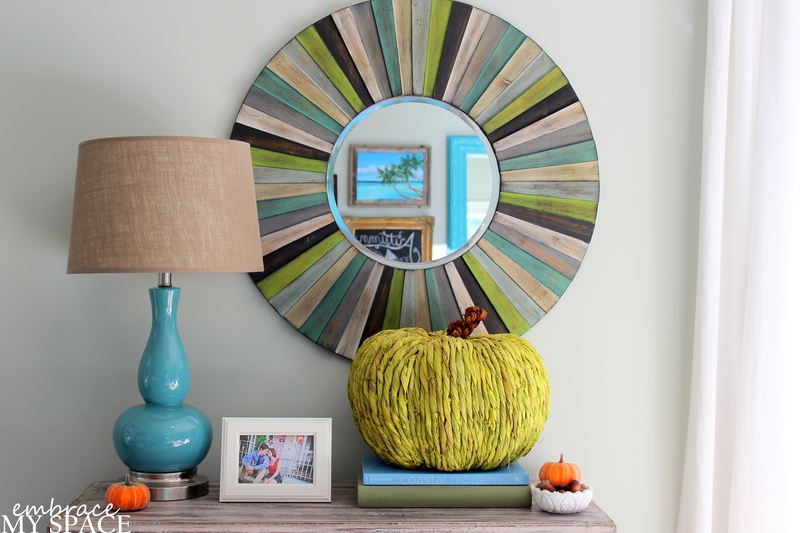 Alternatives would be to swap out a white picture frame for a warm, wooden one or simply hang a piece of art that speaks to the season (perhaps a shot of your backyard in the fall after the leaves have changed?). Sprinkle a few pumpkins here and there. My last go-to for fall is, of course, pumpkins! I don’t have any real pumpkins inside. While I typically cringe at fake flowers and other greenery, I just think it’s easier (and cheaper!) to use faux seasonal decor. That way you don’t spend a fortune decorating your house each year. The one caveat is that you shouldn’t purchase items that are trying to hard to look like the real thing. My big green pumpkin here is made from natural seagrass, which is another nice way to incorporate a faux seasonal element without it looking cheap. 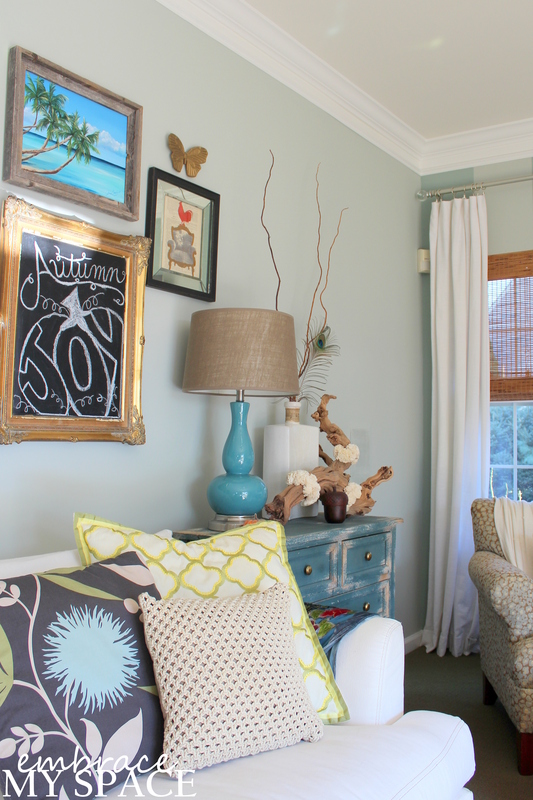 I think the color and texture work really well with my living room’s coastal casual vibe. 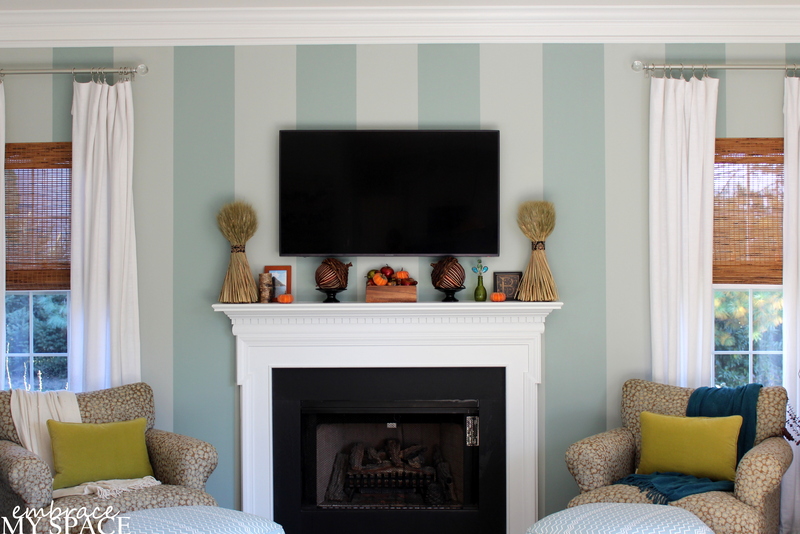 What have you done to ready your home for fall? Do you skip right over this time of year and go right for Halloween, or do you slowly transition your home into the cooler months like I did? If you haven’t already, don’t forget to enter the $200 Sears gift card giveaway sponsored by Coupons.com that I announced last week. You could get a lot of fall decor at Sears for $200! 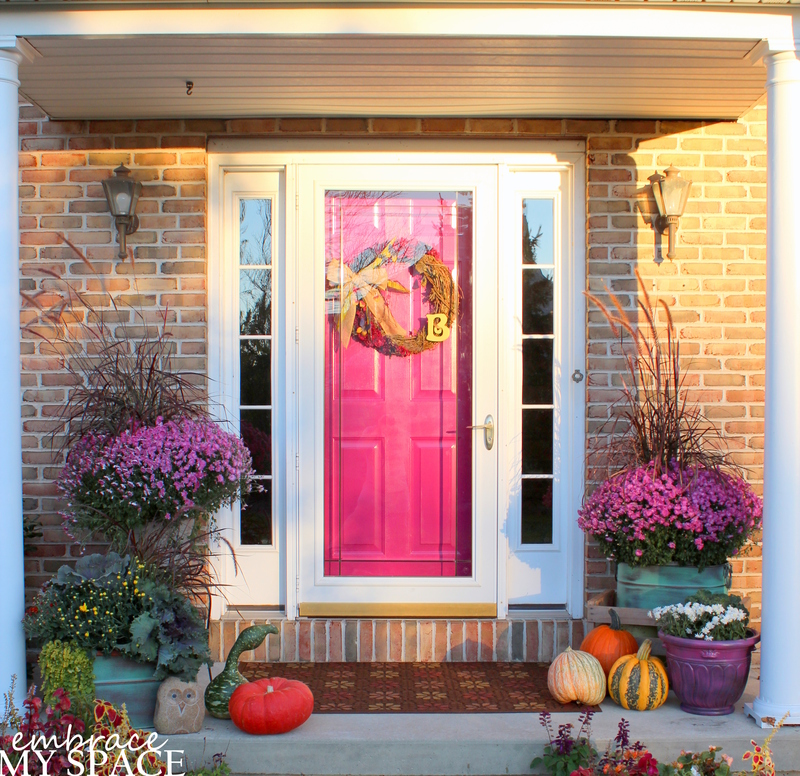 Tonight, In the spirit of Fall, I share with you a wonderful blog called Embrace My Space. Sara has a genuine talent for home decorating and I love her autumn decorations both inside and out! Reblogged : ) what a great post! You have a lovely home! Thanks so much for the reblog! Following you now! Love that sea grass pumpkin. Where did you find that beauty? Your pops of color are great! I’m crushing on your pink door something serious! Seagrass pumpkin is courtesy of HomeGoods! They have a ton at my local store. Do you have one nearby? I’m sure they all carry similar inventory. You choice in color is amazing. Loving the teals, blues, the orange and the greens. I saw those same pillows the other day at Target. 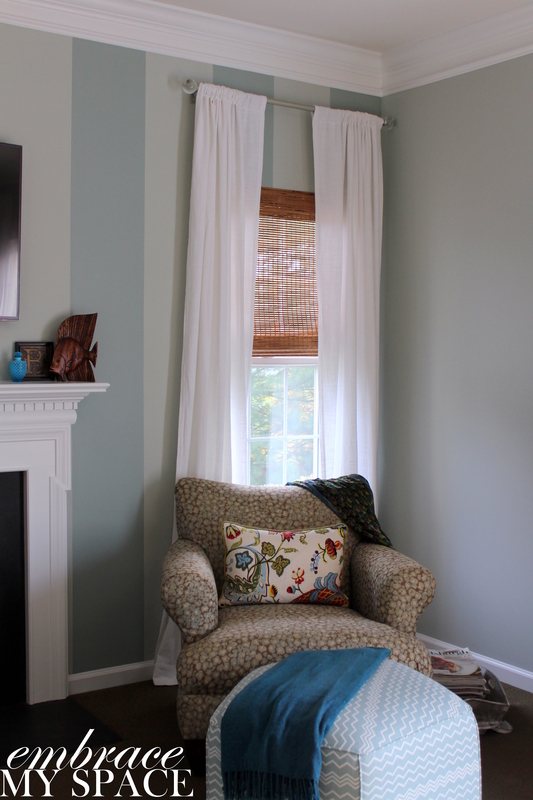 Loved the wall paper choice and window treatments in the living room. Fantastic. Thanks!! I’m a big fan of teal, turquoise, aqua and any other variation of blue so you’ll see it all over my house! !